One of the benefits of being a performance, non-competitive pipe band is the chance to enjoy the summer months without the stress of competition and travel. Now that summer has finally arrived in BC, it’s something many (but not all) RCMP band members are enjoying. Many of us have years of competition under our belts. We know the routine: gearing up Friday after work or hitting the road early Saturday morning to drive to a highland games in Penticton, Seattle or elsewhere in the Pacific Northwest. The days can be long, with constant checking of your watch to make sure you don’t wander too far from the tuning circle, standing in that circle while the heat (or rain) beats down on you, protecting your instrument from the elements and the pressure and adrenaline of marching to the line and competing. There is the draining of tension after the final note dies away, and the camaraderie of fellow competitors in the beer garden afterward. Those days are behind most of us, however our lead tip, Carol Fraser, continues to compete with the New Westminster Police Pipe Band and we wish her well as she prepares for the Seattle games and the World Championships in Scotland in August. 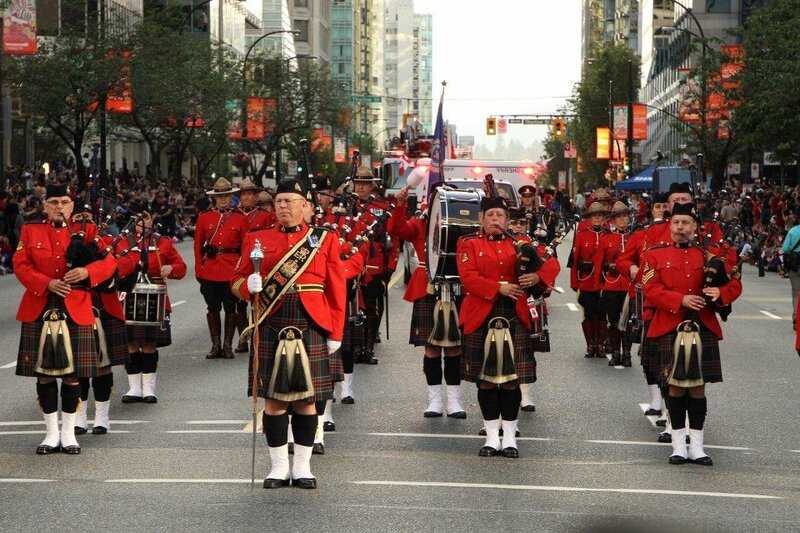 Our band recently played for a great Canada Day parade in downtown Vancouver. The conditions were great. Not too hot or windy, an appreciative crowd and a solid turnout of pipers, drummers and RCMP members (see photo). Now, if only all parades were this ideal! Our band has taken a few weeks off prior to a private function in Whistler in August. We will be gathering for two practice sessions for that event during July, but with the nice weather, it will be a chance to see everyone again, play our tunes outside under the trees of the Justice Institute of BC and forget about the months of cold and wet we must endure here in our corner of British Columbia. I hope everyone has a chance to make it to a highland games and to enjoy the beautiful summer weather that has finally arrived. I know my pipes appreciate it.